The paper presents a brief survey of the phonological structure of Sibe, one of the Tungus languages. The data being analysed is what has been collected in the shape of word list style. Phonemes are established principally on the basis of structuralism, that is, distributions of their allophones. The results in this paper are different from previous studies as follows: (1) There is a opposition of aspirates vs. non-aspirates in obstruent. (2) Uvulars are regarded provisionally as allophones of velars. (3) Retroflexes are excluded in phonological system. (4) Vowel system is composed of only one front vowel of /i/, and four back vowels of /?, ?, o, u/. Except that, some phonological phenomena and rules are introduced, divided into obligatory ones and optional ones. This paper investigates word formation methods of linguistic terms in the literary language of Xibe, as the first of a series of studies to be done on the lexical structures of the language. In view of the results obtained so far from analyzing over 170 linguistic terms of the language (that are now being used in accordance with the principles for forming and using modern Xibe noun terms established in 1988), the word formation methods of the language can be classified roughly as follows: 1. Conversion: e.g. anggai gisun ‘spoken language’←angga ‘mouth’＋gisun ‘language’ 2. Derivation: e.g. gisutun ‘word’←gisun ‘language’＋-tun ‘noun-formation suffix’ 3. Compounding: e.g. ?uturu ‘grammar’←?u ‘sentence’＋turu ‘mysteries’ 4. Blending: e.g. gisumdan ‘language sound’←gisun ‘language’＋mudan ‘sound’ These methods are not different from the common word formation methods generally found in many languages, and thus there is nothing new about Xibe word formation methods. However, since the Xibe language has had very few modern technical terms in it, this paper provides a good opportunity to look into how new technical terms are made in a language which has very few or none of them. This paper investigates Jurchen and Manchu words in The Veritable Records of Jeseon Dynasty. These widely known archives provide 472 years of Joseon history(1392-1803), and present vast amount of historical documents which show crucial evidences of Joseon contacting with Jurchen(later Manchu). In this literature there are abundant Chinesemarked linguistic materials such as Jurchen peoples' names, geographical places, titles of government positions, covering common nouns. The Veritable Records of Joseon Dynasty has its crucial meaning, noting that there exists relatively few materials of Jurchen, in the sense that Jurchen in-use at the period was transcribed by Joseon people. Moreover even though the Records can be seen in other diplomatic archives with Ming Dynasty, it is strongly proposed that first-hand transcribed data is invaluable. In the present study, searching common vocabularies, we compared the data with Jurchen in the Jurchen section of Hua-i i-yü and Manchu and interpreted them linguistically. We found over thirty Jurchen and Manchu-Tungus words, which were mostly numerals and common nouns. We can find frequent government position titles after Ching Dynasty. From our findings we could establish the following phonological phenomena; (a) intervocalic alternation of [g] and [x] (b) deletion of word final [n] (c) addition of [j] in the word final position These phenomena are also observed in other Jurchen and Manchu literature. These phenomena are highly significant in that the words cited in the literature were exactly dated. Further research is needed as The Veritable Records contains are invaluable in various respects such as Jurchen language and their ethnic culture. This paper investigates the place of conversive words in the system of parts of speech in Evenki, and makes their grammatical nature clear. ‘Conversion’ is distinguished from homonymy, transposition, substan- tivization and syncretism. It is noticed that the conversive meaning of word-formation kept its value in Evenki until recently. We discuss the groups of conversive words, which have from two to four intrinsic categorical meanings. It is also pointed out that on the level of speech, the syncretical conversive word of the level of language be realized as only one of its intrinsic categorical meanings, which determine the lexical meaning, the specific-grammatical categories and the syntactic functions of this conversive word in the aspect of its formation. The syncretism of conversive words on the level of language should be considered as the independent and productive method of the word- formation of lexical units. It is one of the key technologies for the transformation-based Chinese-Mongolian MTS to implement the transformation of phrase structures between Chinese and Mongolian language. Referred to the research achievements of Chinese grammar on noun (n.), adjective (a. ), verb (v), preposition (p), noun phrase (np), adjective phrase (ap), verb phrase (vp), preposition phrase (pp) and the translation knowledge of Mongolian Language on those types of Chinese phrases described above, in terms of language material of the Work Report of Government, the author makes a expatiatory and systematic formal descriptions of the Mongolian transformation rules of Chinese phrases such as np, vp, ap, pp for the practical requirements of Chinese-Mongolian MT. Meanwhile, he discusses the grammar and translation problems that relate the phrase transformation. From the output of our Chinese-Mongolian MTS DARHAN, we can see the results of transformation between Chinese and Mongolian phrases are basically correct. That means this set of transformation rules is capable of satisfying the needs of phrase transformation between the two languages in rule-based Chinese-Mongolian MTS. With the aid of Mongoyuhae it is possible to reconstruct the Mongolian terminology that was used to identify kin members in the eighteenth century and earlier. As shown in Mongoyuhae, according to the system of the eighteenth century, Mongolian kinship extends for nine generations, from four generations previous to ego and to the four generations after ego. This kinship system shows these nine generations in a vertical line, beginning at the top with the founder of the kin group (töröl övög), and extending through the nine generations of the patrilineal line from the great great grandfather (hulants övög) to the great great grandson (guch). In the eighteenth century, paternal uncles and aunts(the father's siblings) were terminologically differentiated from their maternal counterparts. Whereas kin terms for affinal kinsmen demonstrate some of the characteristics of eighteenth century Mongolian kinship. The use of kin terms in what we might call the “descriptive mode” is visible in some cases. In addition, there was a tendency in eighteenth century Mongolian society to employ elaborate kin terms such as hüü, ach, jich and guch patrilineal descendants (e.g., son, grandson, great grandson and great great grandson). This tendency suggests that Mongolian society at that period had a strong sense of patrilineal descent than it does now. Some Initial Consonants in Mongolian - With Special Reference to the Chakhar Dialect ? 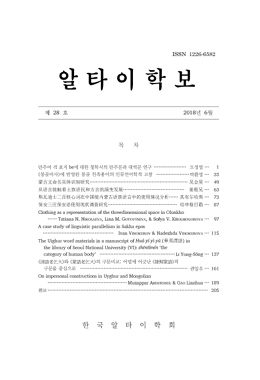 On the Dissimilatory Weakening ofThis article focuses on a kind of sound change of some initial consonants in Mongolian language. In the authors point of view, the sound change is a kind of dissimilatory weakening that some initial consonants (t-, ?-, q-/k-, ?-(si), s-, p-) in written Mongolian change into corresponding weak segments (d, ?, ?, j, dz, b) in some Mongolian dialects. On the basis of examples collected from the Chakhar dialect, reasons, rules and complications of the dissimilatory weakening are probed into. At the same time, related issues such as distribution and chronology of the phenomenon are also discussed. Kalmykia is one of the national republics of the Russian Federation. It is a multinational republic: representatives of more than 90 nationalities live here, of which Kalmyks constitute more than 50%. Kalmyks are also known as Oirats, western Mongols, and European Mongols. The 20th of August, 1609 is the official date of the free will entry of Kalmyks into Russia. The most tragic event in the history of Kalmyks happened in January of 1771, when Ubashi Kalmyks (according to data 70%) back to Djungaria. On the 19th of October 1771 the Kalmyk Khanate was eliminated. The Kalmyk state organization was again returned in 1920, when the Decree of Kalmyk Autonomy was signed. However, in December of 1943 the Kalmyk Republic was eliminated and all Kalmyks were exiled to Siberia. Only after the 20th Party Congress (in 1956) Kalmyks were rehabilitated and the Republic was restored. The song and dance folklore of Kalmyks is original. It differs Kalmyks from related peoples (Buryats, Khalkha, Mongols of Inner Mongolia), for the influence of the Caucasus, the Tartar and the Russian cultures is displayed. The situation of the Kalmyk language nowadays is very dangerous, as the deportation of Kalmyks to Siberia affected the language badly. Kalmyk is a language of the agglutination type. As far as its origin is concerned the Kalmyk language belongs to the west Mongolian subgroup (Mongolian language group, Altai language family). Isolated development of Kalmyk and absence of close connections with the related languages resulted in archaization of some linguistic features and formation of the synthetic forms out of analytical ones. Kalmyk people have a large written tradition. Till 1924, before changing to the Cyrillic alphabet, they used Oirat written language, created by the Oirat enlightener Zaya Pandit. There is a big written inheritance in Oirat in libraries around Russia. 이 글은 한국알타이학회의『한국어의 계통 구명을 위한 알타이어 현지 연구 조사 및 음성 영상 DB 구축』프로젝트의 일환으로 학회의 “몽골어군 현지연구조사 조”가 2003년 9월 23일부터 26일까지 흑룡강성 치치하르시 메이리스 다오르족 구에서 실시한 알타이어 현지 조사를 통해 수집한 언어 정보 가운데 음운 자료를 관찰하고 분석한 것이다. 이 글에서는 두 분 토박이 화자들이 평균 두 번씩 발음한 1162개의 어휘, 219개의 기초 회화 구문, 178개의 문법 조사 문형에 등장하는 모든 모음 요소와 자음 요소를 찾아내 그러한 모음 요소나 자음 요소가 사용되는 보기를 정밀한 전사형으로 제시함으로써 실제 사용되는 모습을 짐작할 수 있게 하려고 노력하였다. 이 글에서는 성백인　(1983), 恩和巴圖　(1988)를 비롯한 이 방면에 대한 국내외 주요 연구 업적과 비교함으로써 치치하르 메이리스 지역 방언이 다오르어의 다른 방언들과 어떻게 다르며, 중세 몽골어나 다른 본류 몽골어들과 어떠한 차이점을 지니고 있는지도 살펴보려고 하였다. 중국어 속의 언어 섬과도 같은 이 방언에 나타나는 중국어의 영향 가운데 음운론적 측면을 살펴보려고 하였다. 치치하르 메이리스 방언 자료에 대한 관찰과 분석을 통해 이 방언이 연구할 가치가 매우 높은 흥미로운 특성을 지닌 언어체임을 확인하였으므로 이 방언에서 발화되는 모든 모음 및 자음 자산을 빠짐없이 찾아내 음소를 정하고 모든 이음들의 성질과 출현 환경을 더욱 정밀하게 규명하는 일, 다양한 음운 현상을 규칙으로 설명하는 일, 각종 비분절 요소들에 대한 연구 분석이 당연히 뒤를 잇게 될 것이다. A small ethnic group of Turkic origin live with the Chinese, the Mongolian etc. in the villages of Wujiazi(五家子) and Qijiazi(七家子) in the Fuyu county(富裕縣), northeast of Qiqihaer(齊齊哈爾) in the Heilongjiang province(黑龍江省) in China. They use the Qyrγys (i.e. Kirghiz) ethnonym as self-designation. According to a local tradition, their ancestors were forced out of the Altay range around 1755-1757 (under Emperor Qianlong(乾隆帝)’s reign of the Qing(淸) dynasty), during a war against the Jungars. The “Fuyu Kirghiz”, their mother tongue, is the easternmost Turkic language except the Yakut. But the “Fuyu Kirghiz” is so assimilated to the Mongolian and later to the Chinese that very few aged adults still understand the “Fuyu Kirghiz” passively, using only occasionally an oversimplified form of it, while the younger generation is in most cases unable to speak or even understand it. The present paper is based on the word materials from the fieldworks during 23-24 September 2003 and during 15-16 January 2004. It deals with about 40 names of parts of human body in “Fuyu Kirghiz”. Our informants used the “Fuyu Kirghiz” in their childhood, but now they use the Mongolian and the Chinese always. The names of parts of human body also demonstrate the close relationship between the “Fuyu Kirghiz” and the Turkic languages in Southern Siberia, especially the Khakas.